ointment. When she approached us for homeopathic treatment on 14th March 2014. As per guidance of her previous dermatologist, she reduced the use of both the creams and stopped in a month. 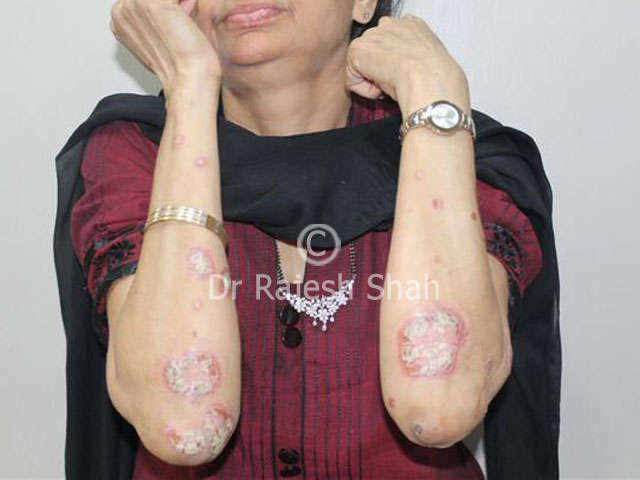 On 14th April 2014, as you can see in the photo, her skin lesions of psoriasis were under control, "masked", as Dr Shah says. She was informed that her psoriasis is likely to flare up now, as the effect of Cyclosporin and cortisone is over. It exactly happened as anticipated. As seen in the photo on 14th May 2014, her psoriasis flared up aggressively, all across the body, exactly as foretold. It must be noted that this is a common experience that previous use of immunosuppressive medicines leads to a flare-up of the disease. The question is "what was achieved by the using Cyclosporin?